A wedding album is the most precious keepsake for a couple. Every couple wants it to be filled with the most beautiful, romantic and unique photographs. Sometimes, making slight changes to the classic poses can make a photograph unique. Experimenting and trying out different styles brings out the chemistry and warmth that a couple shares. This is a must-have in any wedding album. The bride and the groom sit close to each other, and can choose a pose they love the most. It can be the bride resting her head on the groom’s shoulder, both holding hands, looking into each other’s eyes, or simply facing the camera with a smile. One interesting variation could be the bride and the groom sitting on the floor rather than on chairs. The hug is one of the most romantic and cute-looking wedding poses that a couple can have in their wedding album. It can either be a simple warm hug or the groom could hold the bride from the back. The bride could also rest her head on the groom’s chest. This pose will add a lot of charm and oomph to the album. Although classic, this one might be considered a little bold by the older generation. 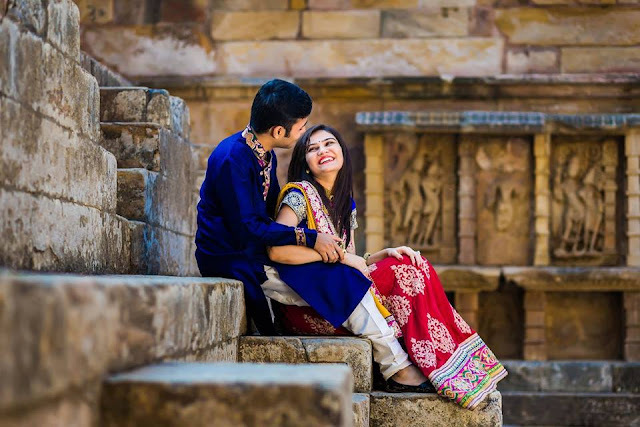 However, this pose creates some candid clicks, capturing the romantic moments shared by the couple. This pose is soon getting very popular among brides and grooms. Capturing the perfect moments as the couple dances, shows the real talent of the photographer. These can be some great additions to the wedding album. The photographer can click as many candid shots as the couple goes absolutely crazy and makes some fun, naughty, mischievous gestures. 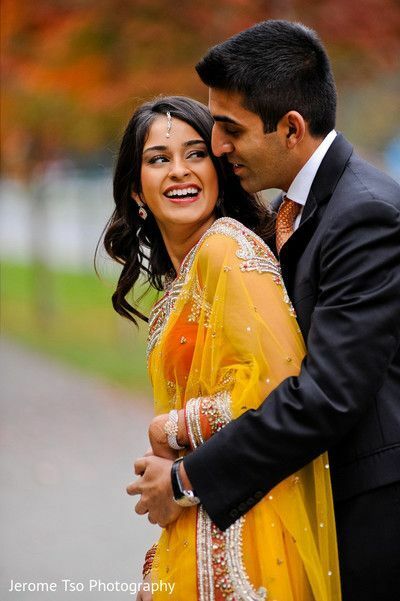 This is something new that is catching up among Indian couples, and is clearly inspired by western weddings. Capturing the couple’s first kiss can be a tricky task. The picture must look very romantic without appearing vulgar at all. For this, the photographer must be alert to click just at the right moment. The foreheads of the bride and the groom touching, makes for a very romantic, warm, yet a traditional pose. As above, the shadows and lighting could be played with to create lovely effects to this pose.